No wonder our bodies are subjected to so much chemical toxicity. There are 34,000 pesticides and herbicides registered with the Environmental Protection Agency (EPA), as well as 65,000 other chemicals. Over one-fourth of the 4 billion pounds of pesticides used in the world are used in the United States. Each year, 10,000 chemicals are being synthesized by industry and added to the over 1 million already in existence. Environmental toxins are chemical toxins that come from outside the body via air, water, food or direct contact with the skin. For toxins to be harmful, they must gain entry into the body. They do this by four methods: 1) Through the lungs by breathing toxic air; 2) Absorption from the gastrointestinal tract, mainly from foods; 3) Through the skin by direct contact; 4) The blood vessels of the placenta – a transfer from the mother to her baby. Virtually all of us are now in a state of toxic overload. No wonder our populations are becoming sicker and sicker. Small toxic exposures each day (from common sources such as breakfast cereal, toothpaste, shampoo, soap, perfume, deodorant, hair dye, newspapers, magazines, exhaust fumes, carpets, new mattresses, dry cleaning or a newly-painted bedroom) will increasingly exceed and even incapacitate your body’s ability to detoxify, causing these chemicals to accumulate to a level that will make you sick. Most people make little effort to avoid toxins because officially established tolerances presume that toxin levels are within safe limits. Unless you make special choices, you constantly eat foods with trace toxins, you constantly drink water with trace toxins, you constantly use personal products with trace toxins, and you constantly breathe toxic air. By the end of each day, these toxic contaminants often reach a substantial cumulative total. EPA scientists found that the total toxic residues in our daily diet can exceed 500 percent of the recommended daily maximum – even if each individual food is within “safe” limits! Most pesticides, herbicides and fungicides accumulate in fatty tissues and tend to settle in the bones. Fluoride builds up in the brain, thyroid and bones. Once in these storage sites, they can remain for decades or even a lifetime. Several studies have shown that the average person – no matter where that person lives (even in the arctic regions) – has 40 to 75 organic chemical residues located in fat tissue – including the breast tissue in women. Take Advantage of the Special $500 Discount Offer Mentioned Below! 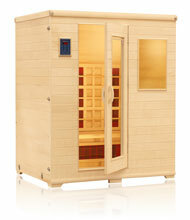 The Infrared Sauna has an excellent reputation for detoxifying both metal and chemical contaminants from the body. It is an excellent therapy on its own or as an adjunct to other natural methods of detoxification. FAR infrared saunas help to accomplish detoxification in the following manner: A layer of fat and oil exists just below the surface of the skin. The FAR infrared light resonates with the water molecules within these lipid or fat cells. This vigorous activation of the water molecule stimulates the fat cells to excrete toxins. These toxins will be released through the skin's sweat channels as a result of the high temperature from the sauna. As sweat and oil are secreted, the toxins dissolved in them are secreted as well. By excreting these toxins and then washing them off your body, the toxic load on the body is lowered and cellular health improves. Oil glands help remove oil-soluble toxins that the body would otherwise have a difficult time eliminating. We have created a world filled with oil-soluble toxins such as gasoline, solvents, pesticides, ingredients in toothpaste, personal care products, etc., which the body is not able to dispose of efficiently. The longer the skin is heated, the more oil-soluble toxins are eliminated. No other sauna company that we know of knows as much about detoxification as High Tech Health, Inc. Their specialty is providing saunas that detoxify safely and effectively. Their Thermal Life® Sauna is designed to allow anyone to detoxify at a rate that is appropriate for them. The Thermal Life® Sauna utilizes specially designed Bio-Resonance™ ceramic heaters that provide the optimal level of far infrared exposure no matter where you are in your detoxification process. A special feature of the Bio-Resonance heater is the nature of the far infrared rays that is emits. FAR infrared is a band of electromagnetic energy, just as visible light and ultraviolet light are. The difference between visible light and far infrared is that we cannot see far infrared. FAR infrared affects the body differently than ultraviolet or near infrared light. Heat lamps emit near infrared which is only absorbed by the surface of the skin. FAR, on the other hand, is absorbed into the body up to a depth of 1 and half inches. It is experienced as a softer heat sensation which is quite enjoyable. FAR infrared rays also stimulate the production of endorphins, the "happy hormones", and have been prescribed for pain for a long time. Bio-Resonance heating technology ensures an enjoyable, detoxifying experience. Hight Tech Health (HTH) researched "carbon heater" technology and found it to be significantly inferior to their trademarked BioResonance® emitters because carbon heaters are inefficient and poor emitters of far infrared waves. If the emitters don't produce good far infrared, then the detoxification effect is diminished. HTH emitters are alloy tubes filled with solid ceramic . The ceramic material is warmed to the temperature range where it emits the highest quality and quantity of FIR waves. (between 6-20 microns). The surgical grade stainless steel reflectors behind the emitters reflect back into the cabin any FIR emitted from the rear of the emitters. This way, the cabin is completely filled with 100% FIR waves and none are lost into the walls of the sauna. Carbon emitters because of their poor design and emission, lose close to 50% of what little far infrared they do emit through the back walls, because there is nothing to reflect the waves back into the center of the sauna cabin. Carbon emitters are large thin plastic or fiberglass panels with a thin layer of carbon material sandwiched in between, or lined with fabric with carbon fibers woven into the fabric, then laminated onto the panels with a wire grid behind them to heat them up. They are made large to compensate for the extreme inefficiency of far infrared light production. They take 40-45 minutes to warm up to the point where you can even get into the sauna vs. our saunas which are warm and ready to use in 10-15 minutes. High Tech Health will not put plastic or fiberglass into their saunas because of concerns regarding possible out-gassing of chemical compounds from these panels. These types of saunas are primarily marketed for recreational use. Another downside to carbon heaters is because of their large panel size, they produce fairly strong electromagnetic fields. HTH heaters emit extremely low levels of EMF's, about 2-4 milligauss, which is equivalent to sitting next to a reading lamp. Carbon heaters are inexpensive to construct. They don't tend to have a long life, and can burn out in 5-6 years. HTH has never had to replace a single heater in the 14 years of selling the Thermal Life saunas. It is by far, the most durable, energy efficient and long lasting technology in the industry. Strength of Infrared – is the heater effective in promoting detoxification? Besides linking to their site in the below-mentioned link, you can call them directly (recommended) at 800-794-5355 or 303-413-8500 and speak to one of their knowledgeable product specialists. By mentioning our website Evenbetterhealth.com, you will receive the discount when you place the order from them. As well, High Tech Health offers a 30 day money-back satisfaction guarantee, so you can try it risk free. They also offer a lifetime warranty against defects in workmanship of the cabin, the heaters, and the electrical components. For more information and to purchase the Thermal Life® Far Infrared Sauna from High Tech Health, Inc., please click here. Glutathione is a short string of amino acids called a peptide. It is composed of three amino acids: glycine, glutamine and cysteine. Glutathione is a major player in detoxifying the body of many toxic pollutants, including toxic metals and chemicals. Glutathione deficiency impairs the body's ability to get rid of toxins whether they are environmental or the by-products of cellular metabolism. If we have low glutathione levels we slowly become toxic, storing away poisons in our tissues, organs, muscles and brain. We simply cannot detoxify effectively if our glutathione levels are too low, no matter what form of detoxification we undertake. Glutathione is made by all the cells in the body, and is the body’s master antioxidant and detoxifying agent. In one review, almost 80% of people with chronic ailments were found to be deficient in glutathione. In fact, low levels of glutathione are involved in all disease states. Why? – because the heavier the cumulative toxic burden on the body, the greater this depletes supplies of glutathione. For example: One molecule of mercury uses up one molecule of glutathione. Since all chronic, degenerative disorders are triggered, in part, by the toxic load, it is small wonder to see why glutathione levels are such an important marker. According to Dr. Marcus Laux, it is important to find an oral glutathione supplement that your body can truly absorb. It survives the trip through your intestines because the glutathione is contained in microscopic little pouches called liposomes. Thus, the glutathione enters your bloodstream intact. According to Dr. Laux, liposomes were recently tested in rigorous scientific studies, and were found to have an amazing 90% absorption rate. That’s comparable to intravenous glutathione therapy, for a fraction of the cost. A cell culture study was conducted on glutathione at the Robert Wood Johnson Medical School by Gail Zeevalk, PhD. The study showed the neuro-protective nature of the glutathione from damage due to the known neuro-toxicants maneb (fungicide) and paraquat (herbicide). Sodium bentonite clay can be a very simple and effective way to remove heavy metals and chemical contaminants from the surface tissue of the body. When you mix bentonite clay with water, it creates a large negatively charged surface area. When the body is in a tub of warm water, the warm water opens up the pores of the skin, and the positively charged toxic particles are drawn through the pores of the skin, to be absorbed by the clay. Most chemical and metal toxins have a postive charge, whereas the clay has a negative charge. Thus, the toxins cannot resist being drawn towards the clay. Bentonite clay has a great capacity for absorbing many times its own weight in toxins. In other words, clay baths have been shown to literally pull pollutants out through the skin, getting rid of many months and years of toxic accumulations. It is important that you find a clay that has been purified, so it contains no mold, yeast, bacteria or fungus. Also, it helps to use a clay that mixes well and disperses easily with warm water to get maximum effectiveness. Some clays do not mix well in the tub, leaving you with a cumbersome and messy clean-up. Being both water and fat soluble, R-lipoic acid passes the blood-brain barrier and has been shown to chelate metals like mercury that can attach to fatty cellls and brain neurons. It has also been shown to help decrease metals from the liver as well. R-lipoic acid also extends the life of other antioxidants like vitamin C, vitamin E, selenium, and CoQ10 in the body. This is important because a heavy metal load creates more free radical activity. The longer an antioxidant can scavenge these free radicals, the less the "detox cleansing" reaction may last. There are two forms of alpha-lipoic acid, an S-form and an R-form. Researchers believe that R-Form may be "up to 12 times more effective" than regular alpha lipoic acid which contains a synthetic by-product. Recommended: One thing we recommend for anyone who has chemical and heavy metal toxicity, is to have a hair mineral analysis test done. How can a hair analysis help one achieve better health? If we consider that diet is what we consume and nutrition is what we retain, then we can see that discovering what the body needs when it needs it is a valuable tool in creating health. A hair analysis can determine which essential minerals the body is needing more of and which toxic elements it needs to eliminate. It also provides valuable insight into the body's metaoblism and what dietary changes would be most helpful for recovery. To view our report on Detoxification for Heavy Metal Poisoing, please click here. To view our report on The Gulf Oil Spill and Dangers of Organic Chemcials, please click here. Thank you for visiting our page on Chemical Toxicity!